A photograph of Prahlad Jani, provided by Sterling Hospitals on April 26. 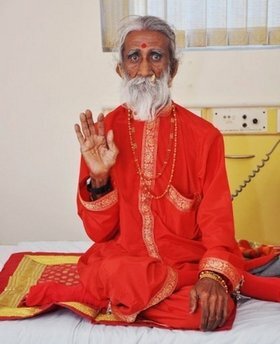 The 83-year-old Indian holy man, who says he has spent seven decades without food or water, has astounded a team of doctors who studied him during a two-week observation period. Upon leaving, three of the American doctors tried to wipe the red dot off Jani's forehead, telling him repeatedly, "You've got something right there. No, right there." The substance was later found out to be Pop Tarts Strawberry filling.